Cucumber, Potato, Onion, Pineapple Mix or Plain. A cold salad of cucumber, tomatoes, onions and green chillies. Lettuce with pieces of cucumber, tomatoes, carrots, onions and green chillies. 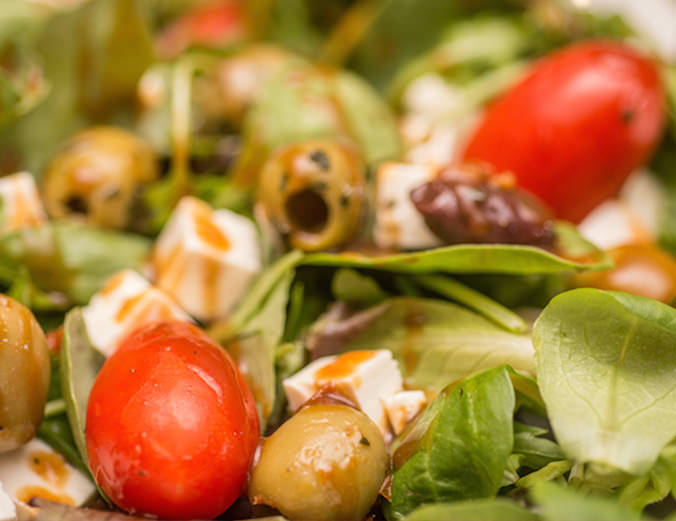 Lettuce, rockets and spinach mixed with feta cheese & olives. B.B.Q. Chicken pieces with bell peppers, onions, tomatoes and a mint. Lentil soup made with fresh herbs and cumin. Served with your choice of garlic or plain naan bread. A thick soup of fresh mixed vegetables and mushrooms. Served with your choice of garlic or plain naan bread. Crispy fried potatoes tossed with onions, tomatoes, chillies and chutney. Mushrooms battered, fried & tossed with garlic and chillies. A Mix of Cassava and Sweet Potato in a pepper and lemon sauce. Crispy mix of onions, potatoes, aubergine, okra, carrots and peppers. Tandoored skewers of home made curd cheese onions, peppers and tomato. Spiced fingers of curd cheese mixed with onions, peppers, tomato and corriander. Chef’s special platter consisting of vegetable starters. (For 4 Persons). King prawns with chilli and garlic. Char-grilled fresh jumbo prawns with garlic sauce. Slices of barbeque lobsters served in shell laced with garlic tomato chutney. Sliced haddock tossed with red and green chillies. Sliced haddock tossed with bell peppers, onions, curry leaves and chillies. Tandoored, skewered boneless chicken pieces in a mild cream & cheese marinade. Skewered boneless chicken pieces in a spicy marinade. Barbeque chicken on bone the everyone’s favourite round the globe. Boneless chicken with a South Indian touch. 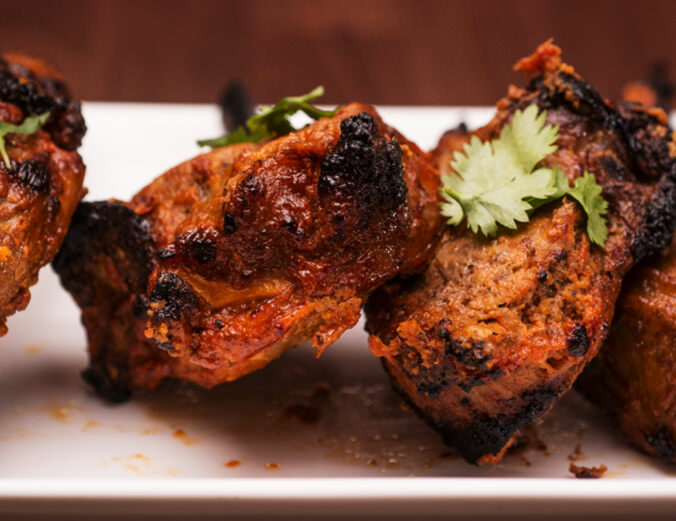 Spiced minced lamb, moulded onto skewers and tandoored. Spiced with a ginger flavoured yogurt marinade. A lamb twist on the globally favourite starter. Chef’s special platter consisting of prawns, fish, chicken and lamb. (For 4 Persons). 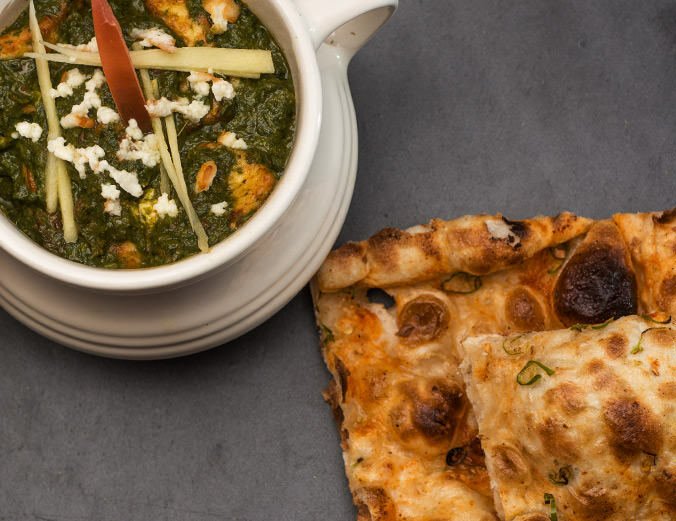 Classic combination of spinach, curd cheese and fenugreek (methi). Baked potatoes stuffed with cashew nuts, curd cheese and sultanas. Patties of vegetables, curd cheese and potato in a special sauce. A traditional masala of mixed vegetables prepared in a kadai (wok). Spicy stir fry of potato, cauliflower and lots of ginger. Mushrooms cooked on an iron griddle with lots of spring onions, pepper & tomatoes. Stir fried okra, onions, chillies and masala. Whole baby aubergines and potatoes prepared in special onion masala. A spicy potato dish with methi, cumin and dry red chillies. Unique taste of creamy black lentils simmered overnight on charcoal embers. Yellow lentils with fresh temper of onions, garlic, chillies & cumin. Chickpeas the authentic Punjabi way. A fresh tasting combination of prawns, tomatoes, onions & coriander leaves. Chef’s version of classic chilli-hot Goan dish with the addition of coconut milk and fresh herbs. King prawns in a traditional South Indian curry. Fillet of Cod steamed in foil with a herb masala and coconut milk. Haddock fillets with a spicy Goan masala mix. Cubes of Tilapia in the Chef’s special gravy. Boneless, Kenyan-style version with lots of cumin, chillies & toasted spices. Boneless chicken in a fresh coriander masala. Boneless Chicken, tandoored and served in a rich masala sauce. Exactly as it is made at home in the Punjab. Boneless chicken in royal mild gravy made with almonds, yoghurt & saﬀron. Lamb on the bone prepared in a curry with lots of onions, tomatoes & spices. Tender lamb morsels mixed with pureed, spiced spinach. Spicy minced lamb with fresh peas, onions, tomatoes & chillies. 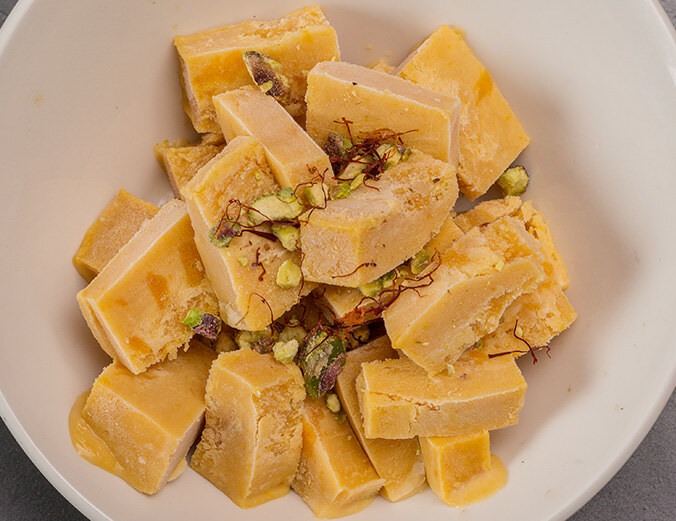 Indian ice cream with Mango bits. Curd cheese disc in creamy milk with nuts and saffron. Evaporated milk spheres in a sweet syrup. Carrot pudding made with lots of almonds. (With or without ice cream). Slices of Alphonso Mangoes or Lychee with vanilla ice cream. (Only when in season). Please check for flavours available today.